In-depth, informative and entertaining, The Annotated Sandman is a fascinating look at the celebrated comic book series written by New York Times best-selling author Neil Gaiman. 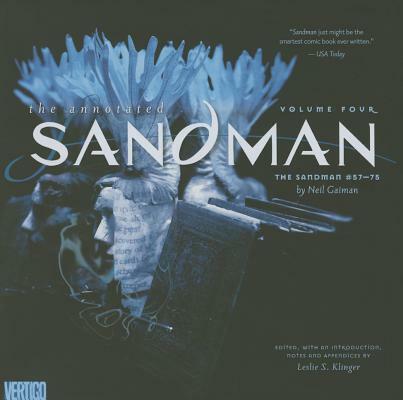 The Sandman is one of the most acclaimed titles in the history of comics. A rich blend of modern myth and dark fantasy in which contemporary fiction, historical drama and legend are seamlessly interwoven, The Sandman is also widely considered to be one of the most original and artistically ambitious comic books of the modern age. By the time it concluded in 1996, it had made significant contributions to the artistic maturity of comics as a whole and had become a pop culture phenomenon in its own right. Critics and readers alike agreed: The Sandman proved that comic books were not simply a genre but were instead a rich and unique medium combining both art and literature. Now, DC Comics is proud to present this literary classic in an all-new Annotated Edition format. Edited with notes by Leslie S. Klinger, The Annotated Sandman is a page-by-page, panel-by-panel journey through every installment of The Sandman. Using the original comic book scripts and hours of conversations with Gaiman himself, Klinger presents a wealth of commentary, references, and hidden meanings that deepen and enrich our understanding of the acclaimed series. This fourth volume, comprising issues #57-75, completes the title’s original run and features an all-new set of appendices, including a detailed chronology of the events of The Sandman and an exhaustive index of all of its unforgettable characters.